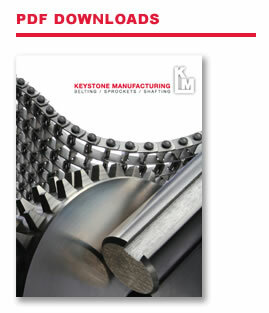 Used with True 1/2" x 1/2" Belts, Keystone's T-Series sprockets feature two full rows of precision machined teeth for uniform tooth engagement on every pitch of the belt. Compared with unmachined, skip tooth, or single row sprockets, Keystone's T-Series sprockets will provide longer belt and sprocket life. the Pitch Diameter to get the Flange Diameter. 2 Stock Bore Notations: NB = No Bore, CB = Core Bore, MPB = Minimum Plain Bore. 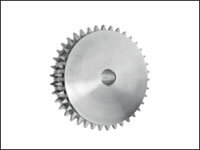 3 Sprocket Number Notations: P = Plastic, S = Stainless, S-316 = Stainless T-316.